As a Doctor of Osteopathy, Dr. Tim has received extensive training in the care and repair of the musculoskeletal system - the network of nerves, muscles, and bones that makes up two-thirds of your body. 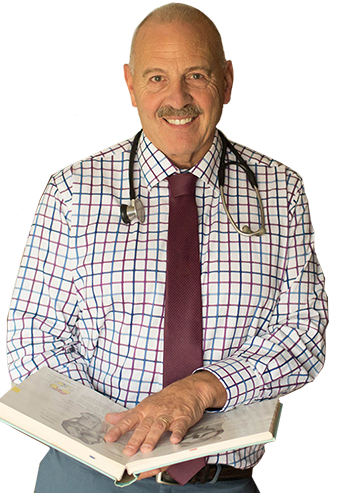 "My goal in this practice is to provide the very best possible health care for my patients so that each of you may enjoy optimal health throughout your lifetime. Rest assured that I will extend to you every courtesy, consideration and recommendation that I would to my own family members." Prolotherapy (also referred to as Stimulated Ligament and Tendon Repair) is the introduction of an irritant solution by means of injection into the weakened ligaments. The irritant solution is usually made up of an anesthetic (Lidocaine) and Glucose (sugar) H20. The proliferant stimulates the production of fibrous tissue and new collagen tissue which will ultimately make your ligaments stronger - permanently. and much more may be helped with Prolotherapy! Stay up to date with Dr. Tim and read about health tips on current, high-interest topics. Were you told you would have to live with chronic pain the rest of your life? This may not be true. Arthritis pain may not be a consequence of old age; it is not a Tylenol or Motrin deficiency. The most common reason for chronic pain – regardless of age – is ligamentous laxity, which may be treated effectively with Prolotherapy. A common cause of unresolved low back pain is injury to the Sacroiliac ligaments, which can be treated effectively with Prolotherapy. Headaches are not evidence of an aspirin, Motrin, Imitrex or Elavil deficiency. Headaches have a cause and that cause can be determined by careful examination. The cause of many headaches may be found by a good listening ear and a strong thumb. The most common cause for pain radiating from the neck to the arm is not a pinched nerve in the neck, but actually weakened ligaments in the neck. Fibromyalgia is often a catch-all diagnosis used for chronic pain. All chronic pain has an etiology. People who have diffuse body pains have tender points on various parts of the body. The tender points are primarily areas where ligaments, tendons and muscles attach to bone. Prolotherapy causes the ligaments and tendons to grow where they attach to bone. Prolotherapy may be beneficial to people suffering from fibromyalgia. Many Sports Injuries are ligament and tendon sprains and strains. Prolotherapy may be very beneficial to a variety of sports injuries. 1. Benign Congenital Hypermobility Benign Congenital Hypermobility is an often overlooked but extremely important reason for chronic pain. Generalized joint hypermobility (loose joints) in the entire body due to ligamentous laxity occurs in about 5% of the population. , Unless properly treated, the end result of the condition is often diffuse arthritis. 2. Ehlers-Danlos Syndrome Ehlers-Danlos Syndrome is a heterogeneous group of heritable connective tissue disorders, characterized by articular hypermobility, skin extensibility and tissue fragility. Conventional medicine does not have a treatment for regenerative connective tissue. Prolotherapy can have an extreme benefit in the condition. Dr. Gustav Hemwall, the world-renown expert in Prolotherapy relates this story: J.M. exclaimed, “Without Prolotherapy, I would have died 10 years ago!” J.M. has Ehlers-Danlos Syndrome which causes extreme looseness of the joints. It is an inherited condition in which the connective tissue, made up of ligaments, tendons and muscles, does not form or heal properly. Conventional medicine does not have a treatment for regenerating connective tissue and is therefore unable to treat Ehlers-Danlos Syndrome. When J.M. finally consulted Gustav A. Hemwall, M.D. the world’s most experienced Prolotherapist, she was confined to a wheelchair. Dr. Hemwall treated virtually every joint in her body, since the disease causes all of the joints to become loose. “It was a miracle!” J.M. told me during her follow-up visit in April, 1997. “I can walk, run, and I’m enjoying life.” Because of a genetic defect in connective tissue healing, this particular condition requires periodic Prolotherapy treatments to maintain joint stability. The usual long-term outcome for people with J.M.’s particular type of Ehlers-Danlos Syndrome is a wheelchair-bound shortened life. Aggressive arthritis forms due to the excessively loose joints, and the joints degenerate beyond repair. Fortunately she received Prolotherapy before this occurred. Many times TMJ pain is due to weakened ligaments of the TMJ (jaw). Prolotherapy can be an effective treatment for TMJ. A tendonitis is an inflammation of a weakened tendon. Prolotherapy can be a very effective treatment to strengthen tendons. Most sciatic pain is caused by weakened sacroiliac ligaments. Again, Prolotherapy strengthens weakened ligaments. “Herniated discs” is a common diagnosis given to patients by their doctors. This may be a coincidental finding and unrelated to the actual pain. The herniated disc is a result of weakened ligaments. Prolotherapy may strengthen the weakened ligaments. In common language, Scoliosis means the spine is crooked. Prolotherapy treatments to strengthen the weakened ligaments may have potentially stabilizing effects in scoliosis.